As the evidence showing the environmental and health benefits of organic and all-natural products continues to grow, the switch to sustainable and eco-smart materials has become less of a fad and more of a practical investment. The scope of this revolution becomes broader every passing day, with “green” and natural alternatives available for almost every product imaginable. One area that has received great attention in the conversion to natural products is the bedding industry. The Foam Factory has seen the benefits these products can provide to their customers and that is why they offer all-natural latex pillows for a one-of-a-kind sleeping experience. Using only 100 percent natural ingredients with no synthetics blended into the formula, these Dunlop latex pillows are hypoallergenic and antimicrobial, inhibiting the growth and presence of mold, mildew, bacteria and dust mites. When present, these irritants can trigger allergies and impact sufferers of asthma. Only food-grade additives are used in the manufacturing of these all-natural pillows, so there is also no worry of harmful chemicals being released and breathed during sleep. Without the inclusion of synthetic additives, the manufacturing process of these pillows is eco-friendly as well. 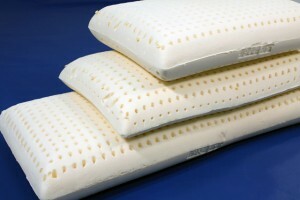 The structure of an all-natural Dunlop latex pillow provides additional benefits beyond environmental and health issues. The millions of interconnected cells, in conjunction with the ventilating pincore design of the pillow, create a naturally aerating material that is effectively a cooling pillow. With every movement, pressure changes cause air to pass through the material while the pores help dissipate body heat and moisture generated while sleeping. The Foam Factory’s latex foam pillows are also resilient and long-lasting. Latex will not flatten over the course of the night like traditional pillows and will not clump or slide away like fiberfill, down or buckwheat hulls. This provides support that forms to the contours of the head, neck and shoulders. Because of latex foam’s spring and strength, support is immediate when changing positions without the material having to recover and re-form to different contours. No matter how much you move, latex foam will be right there to support you. The resiliency of Dunlop foam also means the natural latex pillow will retain its shape for years without forming gullies or broken-down areas. In addition to offering the pillow, The Foam Factory also manufactures custom machine-washable covers. Pillow covers help reduce wear on a product and are much easier to clean than the actual pillow. To achieve the full range of benefits provided by the latex, 100 percent cotton twill covers are recommended to allow for the dissipation of heat and the transfer of air. These are available in nine colors with a zipper for easy removal and laundering. For people who just want the support and resiliency latex foam provides, 100 percent micro-fiber suede covers are also available for a luxurious feel. Available in 12 colors, these feature a zipper to make washing and spot cleaning a breeze. Whether you suffer from allergies, morning aches and pain, feeling too warm while sleeping or simply want to invest in a long-lasting, environmentally conscious product, The Foam Factory’s 100 percent all-natural Dunlop latex foam pillows can help you sleep easy at night and wake up feeling great.